Have you seen the Korean lip tints that come in a wine bottle? The Chateau Labiotte Wine Lip Tint is the original! 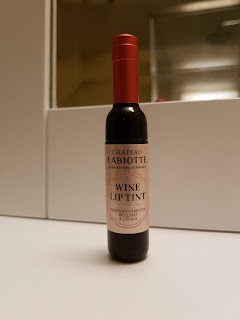 Chateau Labiotte makes a lip tint that comes in a wine bottle. There are a few shades--I have the rose coral one, which is nice but I'm not convinced it's the best color for a tint. I don't generally use lip tints, so I don't have much to compare it to. It's fairly lightweight which is nice. However, it does clump together a bit as it dries. So it tints but then looks like imperfect gloss. It wears off fairly rapidly. Overall, the most successful part of this product is the packaging. The wine bottle makes it cute. I'd suggest it as a clever gift rather than your go-to lip color.